Trailers are understood to be one of the most effective means of movie advertising. This article analyses the effectiveness of the different movie trailers by looking at various parameters required to make a good trailer. 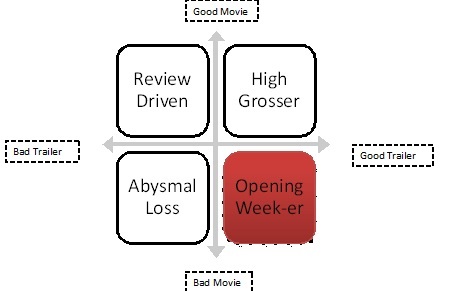 It also analyses the effect of movie trailers on movie revenues, especially on first week collections. Trailers are one of the most expensive and efficient ways of movie advertising as many people decide to watch a movie based on their impression of the trailer. Moreover, with the advent of social media sites such as Facebook, Twitter and YouTube, the sheer scope of a movie trailer for a target audience has grown immensely. This has become even more relevant as movies involve high time value of money and hence are now considered a �high involvement� offering. Moreover, they also face competition from the plethora of alternate available entertainment options. Hence merely putting together a video, written text/ dialogues (copy) and a background score is not good enough. It makes sense to create a trailer, which can entice the customer giving them enough but leaving them wanting for more. In this article, we have looked at the important parameters which make a trailer effective. To judge the effectiveness of the trailer, we have assumed the first week collections of the movie to be the most logical indicator. In order to ascertain this logical relationship we have used regression techniques. Trailer is not a continuous sequence of events portrayed but a collage of different key scenes from the original movie. It is aimed to provide the audience a glimpse of what they can expect from the movie. A trailer achieves the above said through its major components viz., video, audio (music or background score) and copy. The background score, which may or may not include actual music from the movie, plays an important part in binding the scenes and in providing a smooth transition between the scenes. Similarly, copy, be it dialogues from the movie or written, lends credibility to the entire trailer. For example, using the name of Jack Black in the written copy of the movie trailer �Kungfu Panda� lends it the credibility of the actor. The regression results using T-Rating (as per Exhibit 1) as an independent variable and First Week Box Office Collections (%) as the dependent variable establish a relationship between them. The T-Rating is significant at a 95% confidence interval along with the IMDB Rating. Following this, the major findings for making an effective trailer are mentioned below. 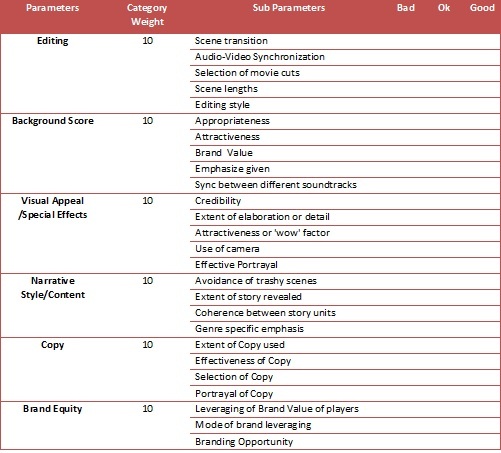 Using regression, we found that, �Extent of Story Revealed�, �Branding Opportunity� and �Credibility� are the three most influential parameters out of 26 sub parameters for T-Rating. An effective trailer always manages to keep the audience curious about the movie. If the amount of story revealed is too much, the audience can guess the rest and would lose interest in watching the entire movie. However, if it manages to convey the uniqueness of the movie by portraying the story to be unusual and different from other movies in its genre, it can generate audience interest. Similarly, miniscule revealing of story generally leaves the audience confused. It leaves the perception of the movie to each person�s imagination, which is a risk that no movie producer can take. Obvious as it may seem, a star-studded cast can capture audience attention like no other. Successful movie stars, directors, franchises (such as Harry Potter, James Bond) can create a buzz or word of mouth publicity around the movie and its trailer. It automatically leads to larger viewership of the trailer and hence increases the reach and frequency. However, star cast is out of the purview of trailer makers and the best that they can do is to leverage the star value of the existing cast. Most often, movie and trailer makers use Computer Graphics. It can lead to loss of credibility if the quality of the movie is not similar to that in the trailer. Moreover, scene compositions, situations and other factors that are portrayed in the trailer need believability. If they stretch audience imagination too far, it leads to loss of interest and negative reactions to the trailer. The characteristics employed in each trailer differs according to the genre that the movie belongs to. 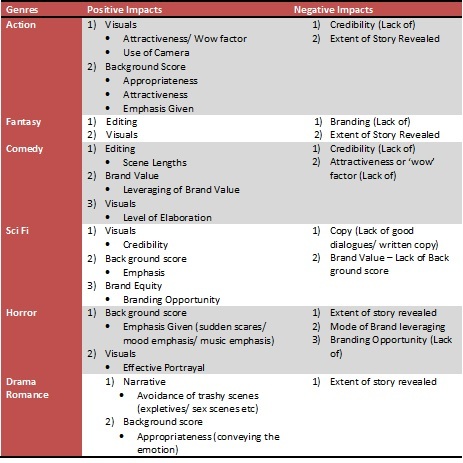 The key influential parameters in different movie genres are listed in Exhibit 3. Considering the most important parameters in a trailer would be extremely useful for movie makers to pull in the crowds in the theater especially in the first week of the release of the movie. Moreover, having a good trailer is all the more important because all the discussions and word of mouth publicity generally happen on the basis of the trailer. This framework can be extended to more specific genres or even a mix of genres.